I don't often get nostalgic about my undergraduate days. I'll admit it--I was an awkward, geeky kid coming out of high school. I was nowhere near ready for the droves of rowdy frat-boy types, the 11 am beer pong, the near constant party going on somewhere down the hall. This, of course, wasn't all there was to college, but when I lived in a dorm it seemed like it, and I was miserable. It took me a long while to find my place. But one of the things I do remember fondly about those days (once I found a real place to live) is the splendid bakery downtown, Pan Chancho. Octavian and I would often wander in on Sunday afternoons to admire the rows of burnished sourdough boules and enjoy a cup of soup. I was doing most of our baking at home at the time, but there were a few things we always found hard to resist taking with us, like a couple of the savoury brioches. They were our favourite--lofty, buttery, herb-flecked--and just perfect with a sharp, lemony salad on a warm day. When it came time to move, I knew I'd miss them. And clearly, I still haven't stopped thinking about those brioches. When Octavian and I were visiting this past December and popped into Pan Chancho, I made a beeline for the cookbooks. The bakery had published a collection of its recipes a few years ago, including one for the savoury brioches. I was determined to have those brioches, wherever I happened to be. Getting the recipe to work for me took some tinkering. The translation from professional bakery to home kitchen has got to be a little tricky. So, while the first attempt was a little disappointing, the second--when I did what made the most sense to me--turned out brioches just as we remembered them--gleaming, golden, buttery, and tender. If there's anything challenging about making brioches à tête like these (tête is just French for head), it's in the shaping. You want to make each round of dough as smooth and uniformly round as possible, and you want to place each tête dead-centre on top of its round. (You also don't want to handle the dough for too long and have the butter melt out on you.) Imperfections will be obvious once the brioches hit oven and start rising. Misaligned and unevenly shaped têtes will bake off-centre. (You can see from my photos that I haven't quite mastered the technique!) It just takes a little practice, and even if your brioches are a bit wonky looking, I don't see anyone complaining once they've taken a bite or two. I planned to have the brioches with a modest soup over a few lunches, but I never quite got around to making any soup before all of the brioches disappeared. (We gave some away...I didn't eat all of them!) But I can say that these brioches are not out of place at breakfast and definitely make for an outstanding afternoon snack. I can even see them taking the place of dinner rolls if anyone wants to have me over for something that needs a little mopping up. Note: Mixing. It might be possible to mix the dough by hand, but I wouldn't recommend it. It will be difficult to pull the dough together, I think, and using your hands to knead the dough will warm the butter too much. Shaping. It takes a bit of practice to get the technique down for shaping the brioches. 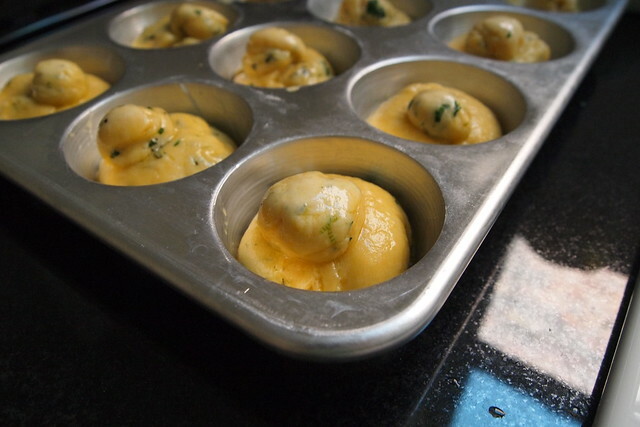 Alternatively, you can use the method that Dorie Greenspan uses here for bubble-top brioches, which is more forgiving. Sift 375 g / 3 cups flour, the salt, and the sugar together. In a stand mixer fitted with a paddle attachment, cream the butter. Paddle in three of the eggs and scrape down the bowl. Incorporate the flour mixture at low speed, 1 cup at a time, and scrape down the bowl. Paddle in the remaining eggs at medium speed, one at a time. Add in the yeast and beat for 1-2 minutes. The dough should have pulled away from the sides the bowl at this point. If it's too wet and hasn't, mix in as much of the remaining flour as necessary on low. Re-fit the stand mixer with the dough hook and knead the dough at medium-low speed for about 5 minutes. Knead in the herbs, cheese, and pepper at low speed. The dough should be smooth and elastic enough to pass the windowpane test. Press it into an even rectangle and wrap it tightly in plastic wrap. Refrigerate for 6 hours or overnight to firm up the butter. 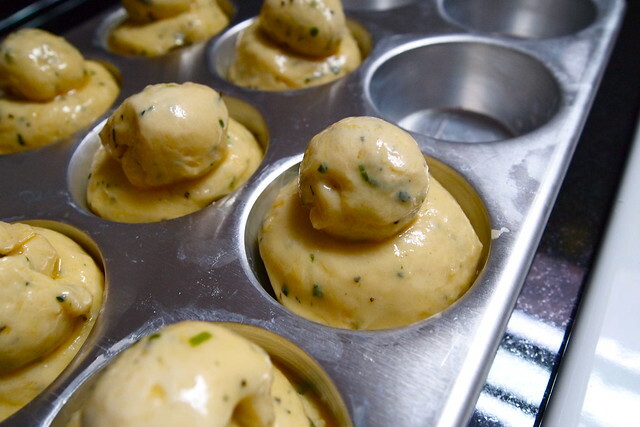 Butter 16 of the cups in two muffin tins or 16 small brioche moulds if you have them. Place the dough on a lightly floured surface. Divide into 16 equal pieces, about 65-70 g each. Cut a bit of dough off each piece, about 1/5 of the total, for the tête. You don't want the tête too small, or it will dry out while baking. Working quickly, shape all 32 pieces into rounds--cup your hands around each and press the edges of your palms into the edges of the dough and pull them in and towards the work surface, rotating the dough and repeating this motion until you have a smooth, even round; pinch the round from the bottom to tighten it. Place the large rounds into the greased muffin cups seam-side down. Press a well 3/4 of an inch deep into the centre of each round. Gently press a tête into each well. Cover with a damp tea towel and let rise for about 90 minutes or until doubled in size. The brioches should pretty much fill the muffin cups, their têtes clearing the tin. Meanwhile, preheat the oven to 375 degrees F. Beat the remaining egg with the water for egg wash and brush the brioche. Bake for 18-20 minutes. The brioche should be golden and their têtes a deep mahogany. Unmould immediately and cool on a wire rack for at least 10 minutes. The brioche are best eaten the day they're baked but will keep for another day in a zip-top bag. These look completely divine. They remind me of these Romanian herb thingies I used to have as a child. So beautiful. Oh wow, these are beautiful! Love the story that goes with it... I wish I could balance out all the things I hate about my university/its town with a lovely bakery! Haha I think I have the same view of the "undergraduate experience" as you do. I'm keeping these in mind though for later. I love the savory-herb version of the brioche--I think I go overboard with making a sweet version of everything all the time. You keep posting recipes that really intrigue me. I guess I have to start a list of things to make and start making things from the list once in a while. 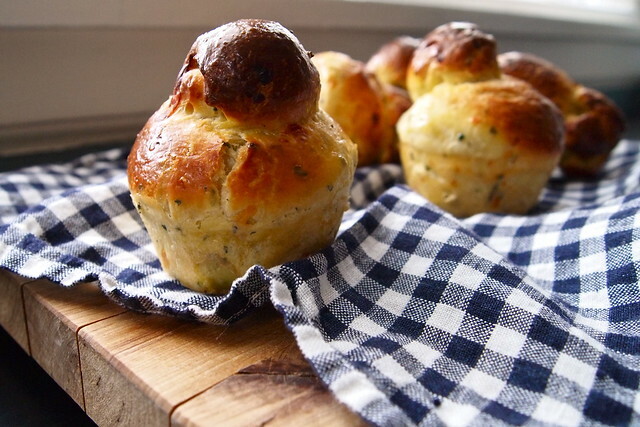 I'd love to make brioches myself, and these herbed, savoury ones look fantastic. Maybe I start my list with these, they seem quite easy to make (exept for the appearance). Thanks for inspiring me to try out new things. Wow, beautiful Katie! First off I'm super impressed that you baked during your undergraduate days. While you were baking I was busy eating hard dining hall brownies and dry cake. blech. Secondly, I don't think anyone is ever ready for 11am beer pong, ever. I'm still not ready for it. Actually I'm less ready for it now than I was back then. The thought of it gives me the shivers. Enough reminiscing, these brioches look amazing, and I'm looking forward to trying them. Gorgeous brioche! I am loving all the herbs you've included. I just planted all my herbs for spring so I can't wait until they're big so I can raid them and try this recipe. 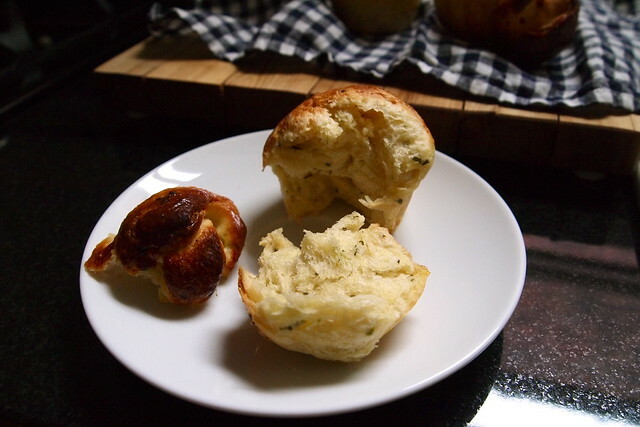 Love your herbed brioches!! The clicks r simply gorgeous... Its my first time here n i m in love with u recipes!!!! I adore brioche and yours look incredible, and they´re savory! I wonder how they named the bakery Pan Chancho? The most unusual set of words. I love it, am still laughing. I had to come back for another look. Ughh :). These are so beautfiul! Im not crazy about the taste of brioche, but my husband is and I'd love to attempt baking them someday. Such gorgeous photos too!!! Thank you everyone for all of your lovely comments! I've been having a little trouble with my internet connection at home, but I think that everything is pretty much back to normal now. Talley, I'm definitely with you on the beer pong. Heaven to Betsy these look mouth watering! I want. I need. Hi, I'm Katie. By day, I'm a philosophy grad student who dabbles in epistemology. By night, you'll find me ruminating over pots of beans, piping macaron shells, or feeding my sourdough starter. Here, I write about what's been going on in my kitchen and what I've been doing around Chicago.